Today, the name of Ken Uston is widely known in the field of blackjack, and anyone cannot imagine him to be someone else but not the most popular blackjack player of 1970s-80s: Uston blackjack career impresses: he is known as the author of books about blackjack, the one who popularized team play at blackjack, the author of some blackjack strategies and the member of the Blackjack Hall of Fame. Though being banned in many casinos for card counting, Uston did not want to confess he used cheating in order to win his millions: he told he used simple techniques which helped him to win but they did not have anything in common with blackjack cheating. So, how and when this genius of blackjack began his career at this game to become one of the most famous figures in the history of blackjack? This meeting is described today as being a very considerable one for the blackjack history: Ken Uston had met Al Francesco, a great blackjack gambler who had his own blackjack team of 21 people and used the concept of Big Player and team play at different casinos winning millions of dollars. They met in 1974 and Al was amazed by Ken Uston’s blackjack skills and abilities to play blackjack. Francesco looked for a new member of his team then and he proposed Uston to join him. Uston had been a member of Francesco’s team for 3 years and won a lot of money for his team. Being a vice-president of the Pacific Stock Exchange, Uston made an impression of a very rich person; so, casinos were even glad to accept him as a player. In 1976, Ken Uston formed his own blackjack team and began winning big sums of money in different casinos of Atlantic City, Las Vegas etc. Such big winnings could not stay unnoticed by pit bosses: they suspected Uston in blackjack cheating and banned him from their casinos. Thanks to this fact, Ken Uston has got one more nickname from his fans – the master of disguise: in order to continue playing blackjack in spite of the fact he was prohibited to do that, Uston wore different costumes and changed his appearance to have a chance of entering the casinos. 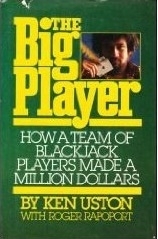 1977 has changed a lot in Ken Uston’s life and his relations with Al Francesco: the book The Big Player was published where Uston told different blackjack stories connected with Francesco and his team, described the scheme of team play at blackjack and opened all secrets of team play in general. Because of this book, Al Francesco and his blackjack team were banned from all casinos forever though earlier nobody suspected them in something like team play, card counting etc. Al Francesco felt betrayed by Uston because he did not even know about Ken’s plan to write a book. Another interesting fact was that the publisher of The Big Player used the case of Al Francesco as a way to promote the book; this situation made Ken Uston to become rather popular as a master of blackjack who helped to disrobe Francesco’s blackjack team. Ken Uston gave up his job in order to devote all his life to blackjack: he wrote books on blackjack topic, played blackjack at different casinos and won millions of dollars. He is also known as a person who took part in the case with Atlantic City casinos: Uston proved the right of blackjack players to use card counting during games as it could not be considered as a way of cheating. Ken Uston died in 1987 because of heart failure; in 2003 he was honored to become one of the top 7 initial members of the Blackjack Hall of Fame posthumously as a person who had made the big contribution to the game of blackjack.